I've yet to see one about a textile artist, but I've not exhausted the series, so perhaps one will turn up. My days seem far more mundane; at least, in part, because I have to do those things or perish! Waiting for me this morning. 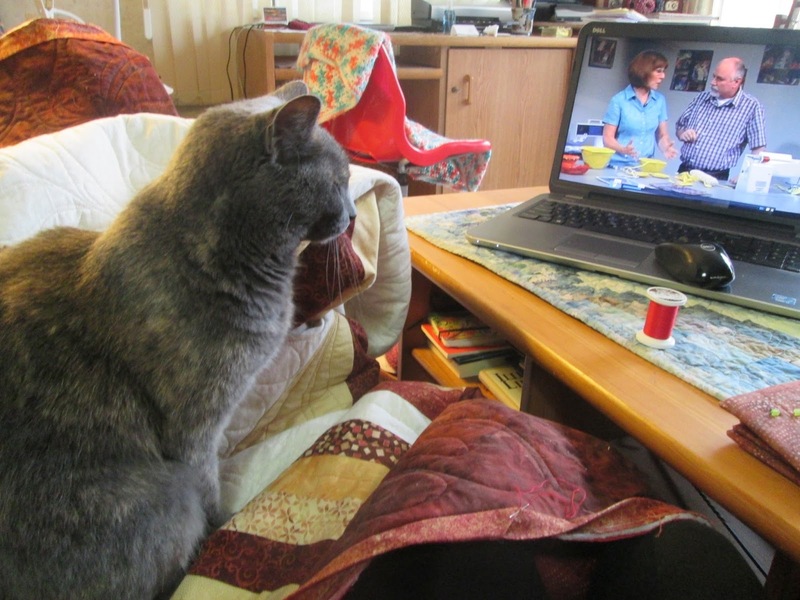 Before you go pouring a cuppa and settling down with some stitching to watch the "WDADAD?" series...here's a glimpse at a typical day in this erstwhile artist's life. 4:30 a.m.: Wakened by the cat, who wants to be fed and let out -- unless the weather is terribly inclement; in which case, she comes back to bed with me. I'm there doing my Morning Pages (bless Julia Cameron!) -- two or three pages of all-one- paragraph-in-a-stream writing to clear the head. This is followed by quiet time -- part of my faith practice, which includes prayer -- usually by candlelight. 5:00 a.m.: Handwork for an hour, usually to the background of The Road Home, "an hour of music and spoken word" produced by broadcaster Bob Chelmick on CKUA radio, and available through streaming as well...HERE. Currently I'm working on my tunic top for my "MOG" (Mother of the Groom) outfit, and the first of a series of stump socks for MOB III, giving them equal time as far as possible. 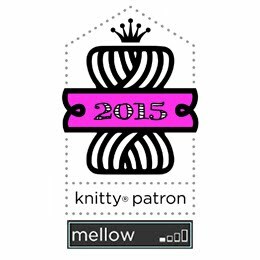 Yarn: Sock It to Me! Collection "Esprit"
9:00 a.m. -ish: Into the sewdio. This week that includes work on my piece (12" square) for this year's SAQA Benefit Auction, piecing blocks for the Japanese taupe quilt (also known as the JTQ or the Wedding Quilt or the WQ) -- work that has to be done involving my cutting table, iron, and sewing machine, or working in my "messy room" doing painting or mono-printing. 11:00 a.m. -ish: Break for the mail -- I have to walk down to the Post Office for it -- and a bite of lunch. Generally also check e-mails (and Facebook, in the 'regular' season)...If it's snowed, I shovel at least the front walks, which are en route to the P.O. Noon-ish: Back to the sewdio or in the living room, which is where I like to do my hand-work. 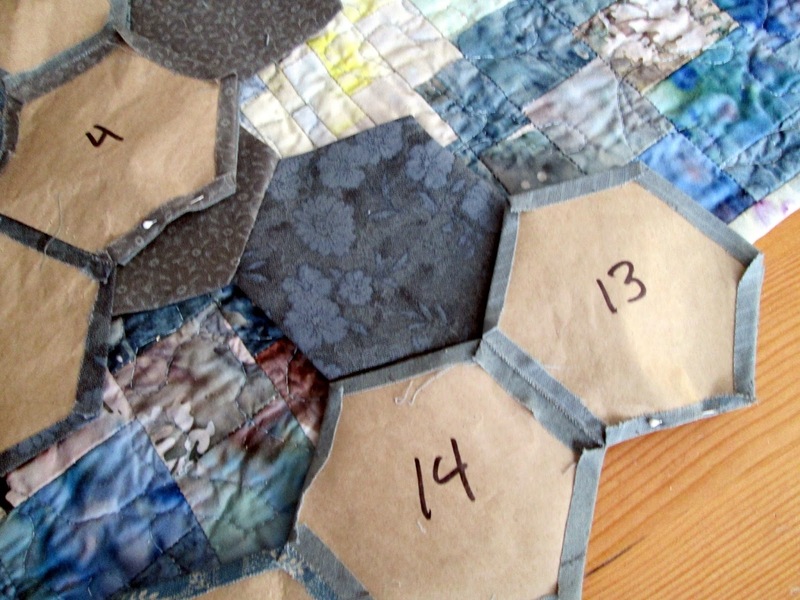 Currently I am piecing the rest of the background for my next 15 x 15 piece, and doing sashiko-style hand quilting on the WQ. 2:30 p.m. - 3:00 -ish: This time varies by the seasons, but during the fall/winter, as the days are short and cold, this is usually the ideal time to set the stitching aside and go for a jog. I'm out the door around 3:00 for a good 45 - 50 minutes. If I deem it too cold and windy, I'll put in an exercise DVD that takes about the same amount of time. 4:00 p.m. -ish: Winding down. 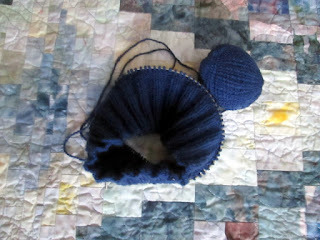 I check e-mails, read blogs, start dinner, and sit down with more stitching and perhaps a glass of wine. 5:00 p.m. -ish: Dinner time! 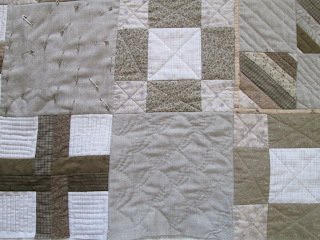 6:00 p.m. -ish and afterward...depending on my energy level, I do more hand-work or simple quilting (i.e., piecing), accompanied by an audio-book or one of the afore-mentioned art clips from YouTube. I also enjoy Bonnie Hunter's "Quilt Cam", episodes of The Quilt Show, the replay of a Craftsy class (Joe Cunningham's my favourite), or Craft In America (either on PBS Videos or YouTube). 8:00 p.m. - ish: Generally, to bed with a cuppa (decaf) and a book (usually a cozy mystery) and lights out when I stop following the words on the page...pretty much always before 9:00 p.m.
By the repetition of "-ish", you can tell this is a pretty flexible schedule. 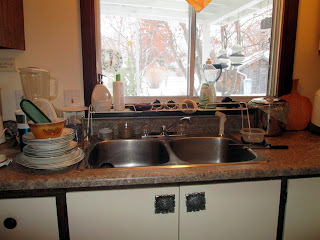 Today, for example, those dishes still await...and I have a parcel to wrap for the P.O....and this blog post isn't being finished very early in the a.m....and so it goes. Tomorrow's another day at the shop, and Friday? An Artists' Date with my friend and SAQA colleague, M. There are two exhibits in Edmonton we want to see (Tom Thomson and The Group of Seven at the Art Gallery of Alberta and X3 -- a collaborative exhibit which includes the fibre artists from Contextural Fibre Arts Collective of Calgary (my friend arlee barr is a member) in the Feature Gallery at the Alberta Craft Council) -- landscapes and textiles...who could resist? Now if you'll 'scuse me...I'm late for the sewdio! 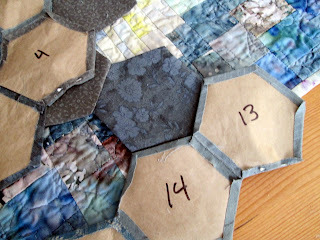 Before I go, I'll link this to WIP Wednesday over at The Needle and Thread Network...and see you later! I'm glad to be in touch with another mystery reader. Have you read the Louise Penny books? Thank you. I enjoyed following through your day. There's so much more to a creative person, than simply what they create. I enjoyed following along on your day. Thanks for letting us get to know you better.